U.S. 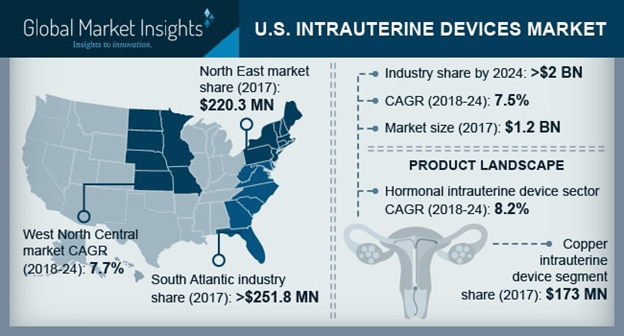 Intrauterine Device Market size is set to exceed USD 2.0 billion by 2024; according to a new research study published by Global Market Insights, Inc.
High number of unintended pregnancies in the country will result in increase in number of intrauterine device adoption among the women in the country. As per research findings, almost 45% of all the annual pregnancies in the Unites States are unintended. But in the recent years the rate of unintended pregnancies has decreased marginally due to the effective use of contraceptives such as intrauterine devices. This rise in product adoption in the country is highly anticipated to continue over the forecast period. There is a growing trend among the women in high resource nation such as U.S. are increasingly delaying their pregnancy until thirties. According to the recent research studies, average first time pregnancy among the U.S. women increased by 3.6 years from 21.4 to 25.0 years in the last few decades. Increase in use of reversible contraceptive methods such as intrauterine devices among the women will drive the U.S. intrauterine device market. Risk of several health issues such as perforation, infection in the fallopian tubes, pelvic inflammatory disease and expulsion may hamper the demand and adoption rate of intrauterine devices among women and hinder IUD industry expansion. Hormonal intrauterine devices accounted for more than 80% market share and valued USD 1,058.2 million in 2017. Several different technological advancements and advantages offered by the hormonal intrauterine devices has spurred the adoption rate among the women in country. Also, the efficiency and effectiveness provided by the IUDs will boost the product market in the forthcoming years. IUD use in women aged between 30 to 34 years will show considerable increase to result in IUD market expansion at a CAGR of 7.7% over the forecast period. Increase in trend of late pregnancy among the women in the country along with provision of favorable regulatory scenario will augment demand and adoption rate of intrauterine device, fueling the U.S. intrauterine device industry growth. North East zone is one of the main revenue generator in U.S. IUD market of the country accounted for around USD 220.3 million in the year 2017. Increase in preference of intrauterine devices over other contraceptive methods such as pills and condoms in the states such as New York, Connecticut and Pennsylvania will augment the business growth in forthcoming years. Demand for IUD in Mountain States is estimated to expand at a CAGR of 7.6% over the forecast period. Increase in awareness regarding IUD applications among the teenage girls, high number of teenage pregnancies in the region and initiatives taken by private organization to grant funds to the women residing in Colorado to purchase IUDs at low cost will boost industry expansion. Prominent industry players that manufacture and sale intrauterine device in United States are Bayer AG and Teva Pharmaceutical. The industry participants use strategies such as enhancing their manufacturing footprint, merger and acquisition, new product launch and geographical expansion in order to improve their marker position and product portfolio. For instance, Bayer AG launched their new hormonal IUD product Kyleena in the year 2016 in order to expand their product portfolio.